The First Patient Promo from The Duncan Group on Vimeo. First year medical students embark on the ultimate expedition to explore the inside of the human body. 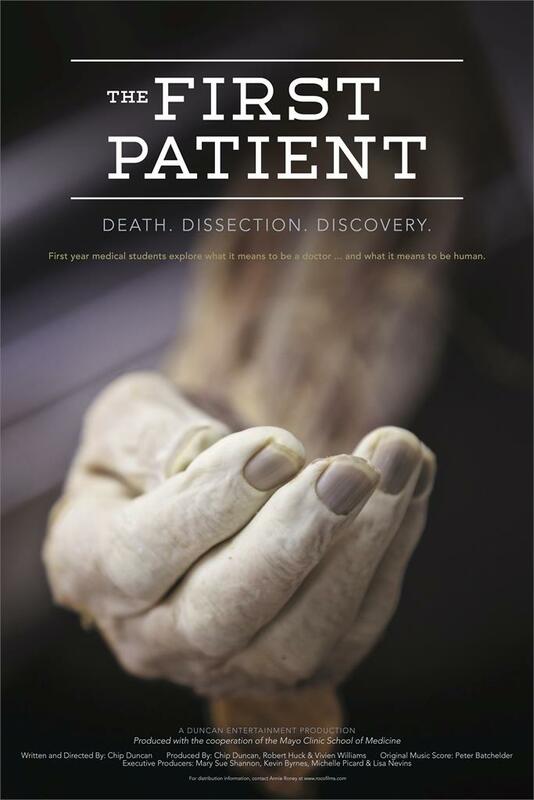 A dramatic journey into an unknown world, "THE FIRST PATIENT" challenges audiences to embrace their curiosity and courage as they follow first year medical students through gross anatomy – the dissection of the human body. The Mayo Clinic School of Medicine granted unprecedented access to veteran filmmaker Chip Duncan and The Duncan Entertainment Group team to explore a world long considered taboo. The documentary proves both entertaining and emotional as the camera follows a diverse group of students, faculty and body donors on this life affirming journey inside the human body. "THE FIRST PATIENT" provides dynamic insights into medical science, teamwork, death and spirituality as students discover what it means to be a doctor ... and what it means to be a human being.